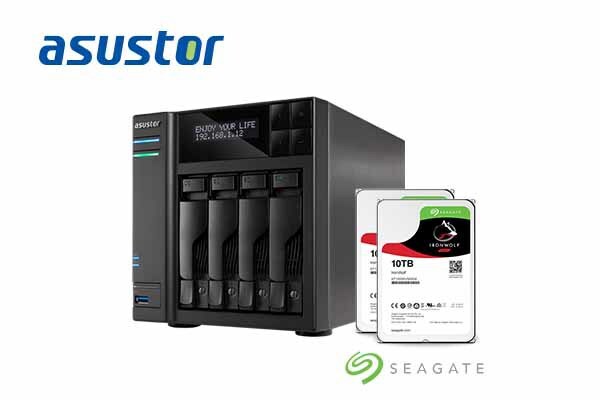 ASUSTOR announces that all of its NAS devices are compatible with Seagate’s IronWolf 10 TB hard disks, 6 TB Enterprise NAS hard disks and 10 TB Enterprise Capacity hard disks. Taipei, Taiwan, August 10th, 2016 – ASUSTOR Inc., a leading innovator and provider of network storage solutions, has announced today that, after stringent testing, all of its NAS products are fully compatible with Seagate’s newly launched IronWolf 10 TB NAS hard disks, 6 TB Enterprise NAS hard disks and 10 TB Enterprise Capacity hard disks. These hard disks are recommended for prosumers and enterprise users looking to create high capacity cloud storage solutions with ASUSTOR NAS. The Seagate IronWolf 10 TB NAS hard disks (model: ST10000VN0004) along with other models in the IronWolf series (1TB, 2TB, 3TB, 4TB, 6TB, 8TB) are compatible with all ASUSTOR NAS devices. Users with 8 bay models and up such as the AS6208T, AS6210T, AS7009RD or AS7012RDX can also choose to use Seagate’s 6 TB Enterprise NAS hard disks (model: ST6000NE0003) and 10 TB Enterprise Capacity hard disks (model: ST10000NM0016).